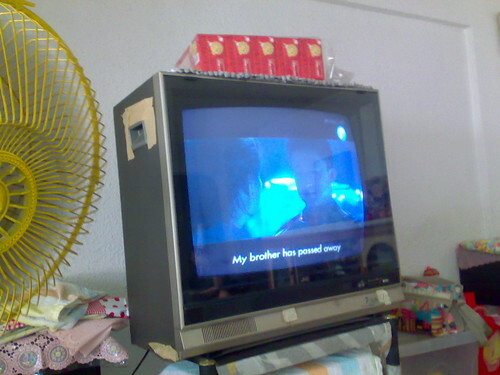 This old TV now sits at my maternal grandma-in-law's place and it's like seeing an old friend whenever I visit during Chinese New Year. I remember very clearly that we bought this TV on the Deepavali weekend of 1986 and there is a story to that. 1986 was the year I was in Secondary 3 where I was in the morning session i.e. I need to up at 5:45am and out of the house at 6:10am on the dot. Any delay and I will be late for school for between my house and the bus stop is a 15-minute brisk walk. Any later and the buses would be so packed with students that they won't stop at my bus stop coz there is no way they can take in more passengers and no one is likely to get out at my stop during that time of the day. So what that means is that I have to turn in early for the night if I were to be able to wake up so early. Problem is that there were a lot of good TV shows screen at the hour of midnight e.g. The Ray Bradbury Theatre, Alfred Hitchcock Presents, etc. What I would do is to set the VCR on timer and videotape the shows where I will return at lunch time to watch them. Just before I leave my house in the morning, I would eject the tape from the VCR that has been recording the night before and pop it into the auto-rewinder below it so that when I return from school, I can save the few seconds of waiting for the tape to rewind so that I can watch the recorded show. Problem that fateful day was that instead of the tape finish rewinding and pop up obediently, the tape inside snapped and the rewinder just went on and on and on until it overheated and burst into flames. What resulted was a melted tape rewinder and on top of the media cabinet was a melted VCR, TV and the air-conditioning unit directly above on the ceiling. It was quite the fire while I was in school but fortunately, the folks in the house were able to put it out but not without the smell of molten plastics filling the house and a charred blackened wall leading up to the ceiling. Thus, the purchase of the JVC TV right on the weekend of Deepavali 1986. Fast forward to a few years ago where the colour was going a bit wonky. We threw it away and replaced it with a flat-screen TV. My grandma-in-law side whom were are frugal background decided to take it and give it a good home. Today means that the TV is 23 years old and the grand dame is running strong sans the masking tape to hold the falling plastic handles and hinges. An interesting story. Speaking of the bus stop, I remember I was late for school many times because the buses were full. If I did not catch the 6:50 a.m. bus, I knew I would be locked out of the school gate by the time I arrived. Is JVC an European television. A belated happy lunar new year. JVC Rox! Mine lasted for ard 20 yrs also. And the subtitle that's being displayed right now seems so apt for this post. And since when is JVC an European brand? So Hitachi is from Korea? Heh..
Everton: I think we both take bus from the same bus stop at East Sussex Lane where we have to walk around the entire RJC campus. JVC = Japan Victor Company. Not European. darkelfin: Gone of there days where we send for the tv repairman. These days, we just throw and buy new one. Hello, I enjoyed your blog and the photos. Can I ask you how you added the Shout Blackboard? Would love that for my blog. Raven aka Ice Pony Girl: Welcome to the blog! Goto How To Do A JayWall Chalkboard. While you are at it, check out the Chalk Board Flowers collection. My Laptop Is Possessed! Sue The Catholic Church!